All our excursions are private, you get minibus with guide and driver and whole program can be changed to meet your interests. Pick up usually in 8–10am in your hotel. If you wish to visit any other places, please tell us and we'll do our best to arrange it for you. Special price for big groups on request. 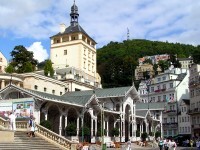 Just 1,5 hour driving from Prague you can visit a renowned spa town Karlovy Vary (Carlsbad). The historical city consists of beautiful parks, noble houses and colonnades with hot springs that you can taste all the time. After the walk through the town you will have a free time for shopping, swimming or you can visit a spa, massage etc. The city is also known for the Karlovy Vary International Film Festival, popular Czech liqueur Becherovka and the world famous glass manufacturer Moser Glass. In this whole day excursion you can discover the two most famous Czech spas. 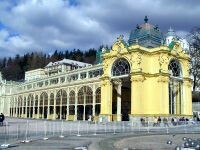 Karlovy Vary mentioned above and more quite Marianske Lazne with tasty cold springs and lots of parks. The town, surrounded by green mountains, is an exquisite mosaic of parks and noble houses. Most of its buildings come from the town's Golden Era in the second half of the 19th century, when many celebrities and top European rulers came to enjoy the curative carbon dioxide springs. From May to September you can watch and listen to a "singing" water fontana. If you would like to visit more, we offer a combination of visit spa Karlovy Vary and when coming back we make a stop in Pilsner brewery to get know all about the world’s best beer. Excursion takes 10-11 hours; brewery entrance is included in price. Other possibility is a combination of glass factory and Karlovy Vary. Excursion takes 9-10 hours,the glass factory entrance is included. Cesky Krumlov is a medieval town situated in southern Bohemia, at a serpentine bend in the Vltava River. It takes 2,5 hour to get there from Prague however you can enjoy beautiful countryside with its typical artificial lakes. After the walk through the heart of the city and the labyrinthine of cobble-stoned streets you can visit the huge magnificent Renaissance castle, overlooking the town. It offers rich collections of period furniture, tapestries, and historical weapons. When we will return to Prague we can have a short stop at Ceske Budejovice or Hluboka castle. We recommend to visit Cesky Krumlov during the transfer to Vienna. If you'd like to know more about glass and its production, please accept our invitation to a prestigious bohemian glass-factory, where you can witness and admire the craftsmanship of the skilled glassmakers. In the factory grounds there's a shop which sells glass for reasonable price. Afterwards in less than 30 minutes time you get to famous and one of the most outstanding medieval castles Karlstejn, founded by Emperor Charles IV in the C14th. We will have a short walk through the village without a visit of its interiors. Glass factory entrance included in price. 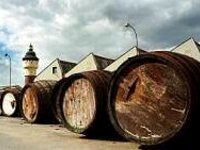 In this tour you will discover the production of two world most famous Czech products - Bohemian Glass and Pilsen Beer. 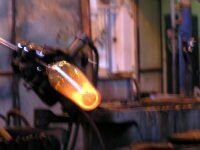 First we will visit the Glass factory in Nizbor, small city 40 kilometers from Prague. There you will see the whole production process and in the factory shop you can buy the glass for nice prices. The Pilsner brewery is located in the capital city of West Bohemia region – Plzen city. Part of the tour takes visitors underground into the tunnels that make up the brewery's beer cellars. Visitors are given the opportunity to drink the unfiltered, un-pasteurized "reference" beer directly from one of the old barrels. Entrances included in price. 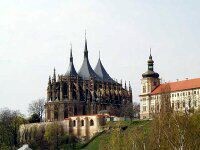 Because of its prosperous silver mines Kutna Hora was the 2nd important town of the Bohemian Kingdom of the middle Ages. Kutna Hora and the village of Sedlec are an UNESCO World Heritage Site. First we will see the famous Ossuary (Bone-Church). At the chapel's interior: the altar and all its appointments, including a massive chandelier, have been fashioned from over 40 thousand human bones, skulls and all. Then we walk around the most important buildings in the area - the Gothic, five-nave St. Barbara's Church, the Italian Court, formerly a royal residence and mint and the Gothic Stone House. Excursion includes entrances to St. Barbara Cathedral, the Italian Court and Ossuary. Duration: 6 hours.